Being organized and by that I mean "A place for everything and everything in its place" is a rule I try to follow, for the most part. Urban living demands that we take advantage of any and every space we can eke out in our homes, which is why door caddies, whether it's for bathrooms, bedrooms or kitchens are so handy for extra storage. 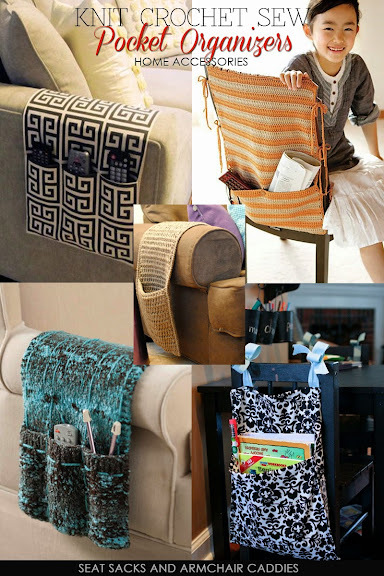 Handmade items used for storing items are extremely popular in home décor lending a casual or rustic air to the overall look, but they come at a price. There is no reason why you can't replicate these wonderful accessories and in some cases necessities to add storage and organize your space. 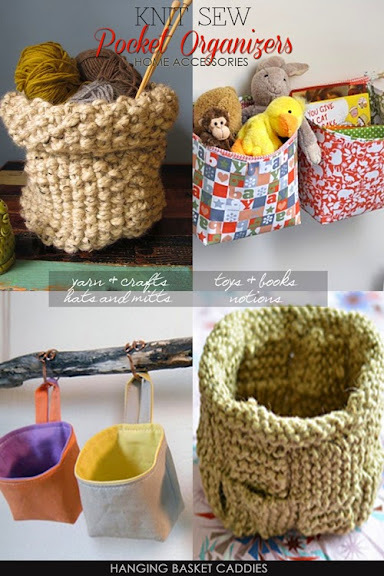 When contemplating a project, I advise using natural materials such as cotton, wool, twine or rope for baskets. You will be much happier with the finished result and the project always look more expensive, something you would have purchased in a chic home décor store. 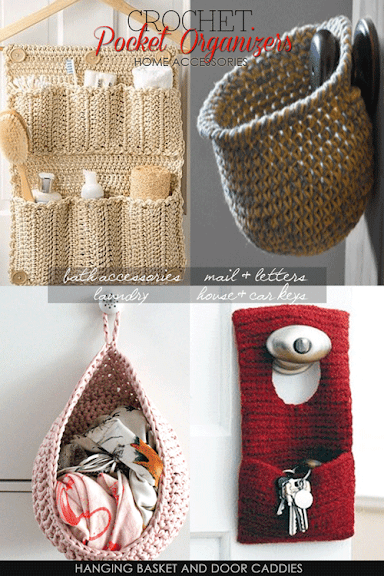 When making door caddies, if you are using twine or cotton, double the strands unless you are using a thicker weight. Doubling the strands gives the caddy stability, when you put heavier items into the pockets. Hallways with a long strip of board and pegs are great for hanging baskets stowing winter scarves, hats and mitts. No space in the hallway, no problem with the key caddy on the back of the front or back door to hold your keys and never panicking looking for them. Hanging baskets on bedroom drawer knobs are great for separating delicate hand wash items from the rest of the laundry. Seat sacks and big baskets for kid's rooms to organize toys or books. Children will be learn how to be tidy if you place hanging baskets within their reach. 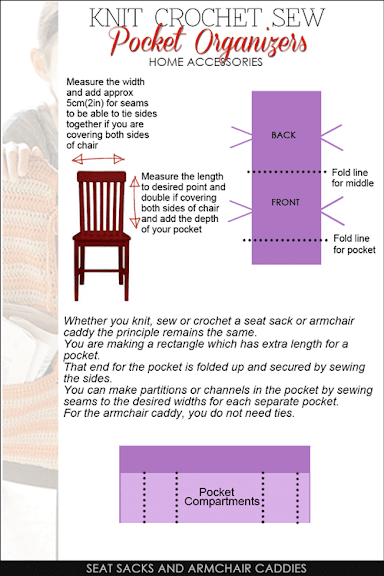 Read further for different styles of organizers and free patterns and tutorials to knit, sew and crochet your own. As you can see from the illustration, there are no universal measurements. Chairs come in different heights and widths. The same rectangle used for chair sacks can be made to fit around a hanger, preferably a wooden one which is more attractive and stronger. Your needs really dictate the kind of storage you make. When purchasing yarn, make sure that it is serviceable in regards to strength but also attractive enough to display in your home. Happy Knitting, Sewing and Crocheting!